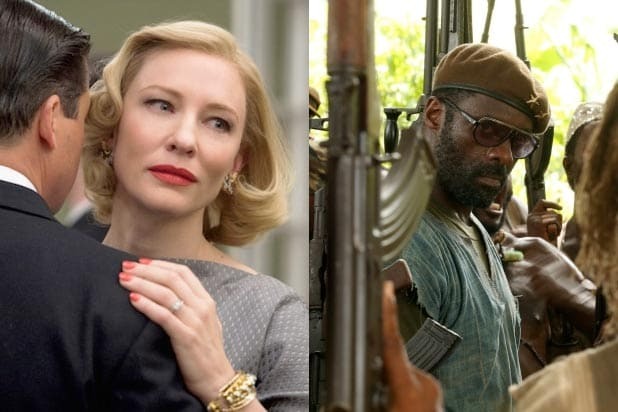 “Carol” and “Beasts of No Nation” led all films in nominations for the Film Independent Spirit Awards on Tuesday, with “Spotlight,” “Tangerine” and the animated “Anomalisa” also scoring well in the indie-film awards. But “Room,” which is presumed to be a strong Oscar Best Picture candidate, couldn’t crack the Best Feature or Best Director category, managing only nominations for Best First Screenplay, Best Editing and Best Female Lead Brie Larson. Film Independent accidentally posted the nominations on its website before the news conference to announce the nominees took place, then quickly pulled them off the site. It was the second year in a row the Spirit Award nominations have leaked early. “Carol” received six nominations and “Beasts” received five. “Spotlight” received four and also won the Robert Altman Award, which goes to a film’s director, casting director and ensemble cast. “Anomalisa” and the micro-budgeted “Tangerine” also received four nominations, while “It Follows,” “Diary of a Teenage Girl,” “Room,” “James White” and “Mediterranea” received three.